It’s almost impossible not to love France. But between business trips and personal trips, we hadn’t made it out of the northern part of the country…until now. 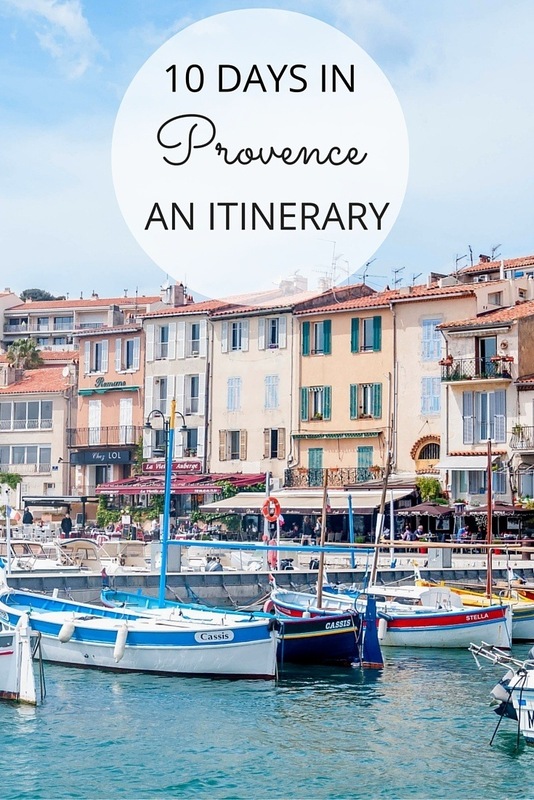 This 10-day South of France itinerary took us through small towns and larger cities, to Roman ruins, lush vineyards, seaside retreats, and to all the local Provence markets we could possibly want. The first five days of the trip were done using Avignon as a base and traveling via public transportation. For the last five days of the trip, we rented a car and used Saint-Remy de Provence as a base. The two main ways to travel to Avignon are by flying into Paris or Marseille. From Charles de Gaulle airport in Paris, you can take the TGV train to Avignon’s TGV station and then transfer to the city center (about 3 hours). Or, you can fly into Marseille and take a local train (30-60 min, depending on the train). Our first day exploring Avignon brought a stop at the bustling indoor Les Halles market. Even if you’re not buying groceries, this is a great place to acquaint yourself with one of the most important things in Provence—the food. Sample some goat cheese, breathe in the olives, and grab a tart and a glass of white wine for a light lunch. If it’s Saturday morning, don’t miss the cooking demonstration. In the afternoon, we strolled through the lovely Place de l’Horloge on the way to the Palais Secret tour at the Palace of the Popes. While we didn’t strictly need a guided tour of this UNESCO World Heritage site, it was a great way to see areas that aren’t otherwise open to the public, and the view from the roof is worth it. After our tour, we headed a few steps across the plaza to the Musee du Petit Palais. It contains a world-class collection of Renaissance works, all dealing with Christian themes. We capped off our day with tea at the famous La Mirande hotel. Our second full day in Provence was just as full as the first. We visited the Parc Rocher des Doms, a sprawling local park with beautiful views near the Palace of the Popes. From the park, it was an easy walk to Avignon’s famous bridge, Pont Saint-Bénézet, which only partially crosses the Rhone thanks to the erosion that comes with regular flooding. We also wandered the Rue des Teinturiers, a tree-lined street with an unexpected complement of canals and waterwheels. This area is home to a number of shops and galleries as well as the affordable and un-touristy La Cave des Pas Sages wine bar. If you have access to a car or other transportation, a visit to Manguin distillery just across the river is a fun outing. Saturday morning tours (in French) show the production of brandies and liqueurs and the pear orchard where bottles seem to grow on trees. With its mix of culture, history, and delicious things to eat and drink, Avignon is undoubtedly one of the best cities in the South of France. Skip the line at the Palace of the Popes, see other Avignon highlights, and go wine tasting on this half-day tour of the city. Consider an Airbnb. You can get a $40 credit when you sign up. A quick train ride from Avignon, Nimes was our second stop on our 10-day South of France itinerary. The city dates back to Roman times, which is obvious by its centerpiece, the Arena of Nimes. Built in 70 AD, the arena still hosts bullfights and other events. Another popular site in Nimes is the Maison Carree, one of the best-preserved temples in the Roman Empire, which is amazing when you consider that it is over 2000 years old. Nearby, the city’s indoor market makes a great option for lunch. Before leaving Nimes, we had two more stops. The first was the Musée des Beaux-Arts of Nimes, a fantastic museum featuring a collection of 3600 impressive works of fine art and sculpture from Roman times to the Old Masters. Then it was time to get outdoors and spend some time at the Jardins de la Fontaine, an 18th-century public park modeled after the gardens at Versailles. It was gorgeous, and we spent way more time than was reasonable, but the park was an unexpected highlight of our South of France trip. This 5-hour guided tour of Nimes, Pont du Gard, and Uzes will let you see the sights near Avignon the easy way. Another easy day trip from Avignon, Arles is one of the most picturesque places to visit in Provence. Splashed in blues, yellows, and greens, Arles makes you feel like you’ve stepped into a Van Gogh painting for good reason—you have. All over the city, you can see the exact spots where Van Gogh painted some of his greatest works, along with replicas of the works and some of the story behind them. Other spots not to miss include the Arles Amphitheater and Alyscamps (a Roman necropolis), both of which are UNESCO World Heritage sites. If you visit on a Wednesday or Saturday, the market on the ring road will be impossible to miss. Stroll through to see the cuisines of France, Spain, Italy, and North Africa all on display. You can’t travel to the South of France without visiting Aix-en-Provence. Luckily, the alluring city is connected by bus to several towns in the region; line 23 took us there from Avignon in just over an hour. A visit to Aix is less about how many things there are to see than it is just about experiencing the joie de vivre of Provence. There are sights like the city’s many fountains, Cathedrale St. Sauveur, or Place d’Albertas, an 18th century mansion. But we spent our day in Aix-en-Provence strolling through the five markets—the farmer’s market, the flower market, the antiques market, the fruit and vegetable market, and the textiles market—that were open in the city’s center that day. When we were done gawking and tasting, we wandered under Aix’s beautiful plane trees, bought some macarons, and snagged a place for a late lunch at Les Deux Garcons, an old favorite of Picasso and Cezanne. We opted to visit Aix as a day trip, but it’s a popular place to stay overnight. After picking up our rental car at the Avignon TGV train station, we were off on our journey deeper into the Vaucluse region. The first stop on this part of our South of France itinerary was only an hour’s drive from Avignon–Roussillion, a tiny village of less than 1300 people known for its amazing ochre deposits. We stopped at the small morning market in Rousillion (of course) and hiked along the streets that crisscross the hilltop, winding past small shops and homes and stopping for the sweeping views of the valley below. The ochre cliffs are also not to be missed here, whether you opt for the 30- or 60-minute walk. We paused briefly at the town’s unique cemetery before continuing our Provence road trip. A on a short drive down D2, D15, and ultimately D177 led us to Abbaye Notre-Dame de Senanque. In the summer, the field in front of this 12th-century abbey is full of brilliant purple lavender. It’s beautiful on the outside, but tours of the interior are also available. Stop for photos and to breathe deeply before getting back on the road. Backtracking a bit on D177 took us to the breathtaking hillside village of Gordes. If it’s mealtime, it may be worth a quick stop in town, but we found the view from a bit farther away to be the ideal way to experience Gordes. After taking more pictures than were necessary here, we were bound for our new home base of Saint-Remy de Provence. Day 7 was Cotes du Rhone day! The Cotes du Rhone wine road runs over hills and valleys through this part of the South of France, passing numerous vineyards and wineries along the way. We started off at Domaine de Mourchon for some full-bodied reds and drove Le Col de la Chaine Mountain Pass to Domaine Saint Amant for an afternoon wine tasting. Stops in Suzette and Gigondas and at several other wineries made this a perfect day. We write in much more detail about the route here. If you’re a lover of French wine or gorgeous scenery, make this part of your trip to the South of France. Don’t want to drive? See prices, reviews, and details for this 5-hour Cotes du Rhone tour from Avignon. After two days full of driving in Vaucluse and the Cotes du Rhone, we decided to take day 8 a little easier with only two destinations. Though the road changes designations a number of times, the 45-minute route from Saint-Remy de Provence to Pont du Gard is fairly straightforward, and the bridge is very well signposted (the basic route is D99 to D90 to D986L). Another UNESCO site, the Pont du Gard is an extremely well-preserved aqueduct that once carried water from a spring in the town of Uzes to the Roman colony at what is now Nimes. It spans the Gardon River where people still swim and kayak beneath its arches. After seeing the visitor’s center and exploring the bridge from every possible angle, it was time for another drive. We took a quick road trip down D981 to Uzes . When we arrived, it seemed that the whole town was consumed by market day. In addition to the market stalls, regular businesses set up shop outdoors, and all the sidewalk cafes were filled with people enjoying the spring afternoon. Several Medieval buildings still stand, but the real appeal of the town is wandering its old lanes and squares, doing a bit of window shopping and enjoying the atmosphere. Though it’s impossible to compare all the places we visited, Cassis was certainly one of our favorite stops on our southern France travel itinerary. Not only does Cassis have stunning natural features, its location right on the water of the southern coast of France couldn’t be more ideal. From Saint Remy, it’s a bit of a drive on the A7 and A55 that send you through Marseille, so don’t attempt this around rush hour. From there, the A50 will send you into Cassis. The whole drive takes about 1.5 hours, but it’s worth it. In Cassis, we enjoyed a lunch of fresh fish and local wine while staring out at the boats on the harbor. In the afternoon, we took a boat cruise of the calanques (the area’s amazing limestone cliffs that plunge into the sea), followed by the curvy La Route des Cretes drive, which sends you to a vantage point high above the town. If you’re coming from Marseille instead, consider this full-day tour of Marseille, Aix-en-Provence, and Cassis. A half-day tour of Cassis is also available from Aix-en-Provence. If you want to see the calanques up close in a unique way, see reviews and prices for a snorkel and scuba diving tour. On our last day in town, it was finally time to visit the two main sights of Saint-Remy de Provence – Saint-Paul Asylum and the Glanum ruins. The asylum was home to Vincent van Gogh for a little over a year in 1889 and 1890, shortly before his death. 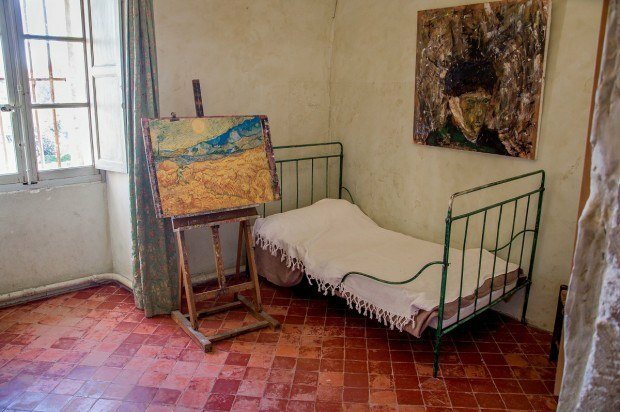 Visitors can see van Gogh’s room and the settings of many of the works he completed while he was a patient here. Essentially across the street from the asylum are the Roman ruins at Glanum. Over 2000 years old, most of the ruins of the ancient town are foundations of buildings, so a visit here requires a bit of imagination. There are a few great structures, however, including and arch, columns of a temple from 20 BC, and the Mausoleum of the Julii, one of the best-preserved mausoleums of the Roman era. From Saint Remy, we headed north on A7 and D977 to Vaison la Romaine where we explored the Roman ruins of the town as well as the market. Our final stop before returning our rental car in Avignon took us down D975 to the town of Orange. As with several of the other stops on our Provence itinerary, Orange is renowned for its Roman architecture. The city’s main sight, the Ancient Theater of Orange, is still well-preserved and used for occasional performances. The original statue of the Emperor Augustus still looks down on the crowd from the 2000-year-old stage. Certain places in Provence are easier to see via a rental car than by public transportation. The good news is that—unlike many places in Europe—there is an ample supply of automatic transmission cars at reasonable prices. We’ve rented with many different companies in the past, but we found that Auto Europe’s comparison tool helped us save money in France. Before you go, we recommend getting a copy of our book, The Essential Guide to Driving Abroad, which demystifies and simplifies the process of renting overseas. Provence and the South of France is an amazing destination! While the country is extremely safe, car accidents can happen. For this trip, we bought travel insurance from Travel Guard because it’s always good to be prepared. Booking through these sites may help support Travel Addicts and earns us a few pennies, at no additional cost to you.